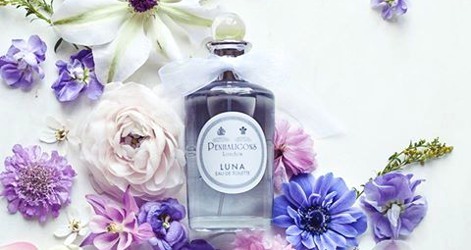 Penhaligon's recently launched two new fragrances, Luna for women and Endymion Concentré for men, inspired by the ancient Greek myth of the moon goddess and her mortal lover. I can never resist a good (and weird) love story, and I'm a "moon child" born in June, so I looked forward to sampling Luna. Luna is described as a "fresh floral" with top notes of bergamot, lemon and orange bigarade, heart notes of rose, jasmine and juniper berry, and base notes of fir balsam, ambergris and musk. It sounds a little more complex than it actually smells. It opens with a delightfully realistic citrus bouquet, not too sweet and not too tart; the bergamot is especially "present," but the orange is there too. After that, things get a little vaguer. I associate jasmine with the moon, due to its narcotic quality and waxy white petals, but Luna's middle phase slants instead towards a sheer, just-picked rose. That's fine with me, just not what I expected. There's a hint of green juniper, and the dry down is a very mild transparent white musk. Luna is definitely the "crescent moon" mentioned in the official description, not a brooding full moon or a fiery harvest moon. I like Luna; it feels light and fresh on hot days, and it's perfectly office-appropriate. It reminds me a bit of La Cologne de Rosine. The one problem: it's really fleeting on my skin. I can only get about two hours out of it. And I'd hesitate to pay so much for a fragrance with so little staying power, but what do I know? Luna is currently the local best-seller for Penhaligon's in New York City, followed by Endymion Concentré, Vaara and Juniper Sling. Penhaligon's Luna is available as 100 ml ($170) Eau de Toilette. For buying information, see the listing for Penhaligon's under Perfume Houses. Hah! I actually liked Endymion Concentre when I sniffed it in the store. It reminded me of Caron Pour Un Homme and the deep blue bottle is gorgeous. I’ve never even heard of Luna! I am leery of “fresh” as a description and traumatized whenever the word bigarade appears on the name or notes list, reason being I once accidentally sprayed myself with FM Bigarade Concentree and all I smelled was unwashed sweaty armpit. Every time you mention your perfume scarring it makes me smile. ???? I know what ypu meant :-). I really shouldn’t be this traumatized! Oh! Well, I don’t think I’m prone to getting that sweaty effect from citrus, fortunately…but this fragrance is new, in any case, so it hasn’t gotten much chatter yet! It’s interesting to learn what their best sellers are. Wow, people are into really such light perfumes these days! Perhaps that’s an unintended consequence of the decline in smoking. The vaping generation has a lot to answer for. Best seller in NYC? It must be the tourists picking it up. NYers are much more edgier than what’s described for Luna. Does Penhaligon even create edgy scents? Proper British, croquet in the grass & all that is all I think of for this brand. I asked about the “top 4” display and was told that they were “local” best-sellers — and I agree, they’re not very edgy, but they sort of make sense. Endymion and Luna are being promoted because they’re brand-new, and Juniper Sling *does* work well in summer. Vaara…I don’t know! Vaara is pretty, and it works better for me than, say, Stella as a light, inoffensive rose scent. Maybe it seems like a safe perfume to buy as a gift? Argh, meant also to say, in my reply to Floragal: if this is indeed a NYC ranking, the only other places to buy Penhaligon’s in NYC before until this week were Saks (so many tourists!!) and Aedes. If the Saks numbers are driving this ranking, it definitely makes sense that tourists are doing most of the purchasing. These light perfumes seem like they are for the crowd that wants to smell good without feeling like they’re wearing perfume. It’s like applying makeup so it looks like you’re not wearing makeup. I have those days when I want something where I’m only vaguely aware of its presence-especially in Summer.